We will be the first ones to admit that chronic pain is tough to figure out and treat. There are often so many unknown variables, but we have to start with what we do know. You know how you feel, and that is powerful and important, but we have to capture that information. Keeping a pain journal is a great way to do this. 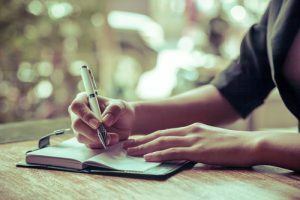 If you’ve been battling chronic pain for years, it’s not too late to start a pain journal to help you document what you feel on a daily basis. This is where you can write down everything relating to your chronic pain, including what kind of pain you have, what level of pain you are experiencing, what you were doing when you were in pain, and more. This information is useful for you and for us as your doctors. We can use it to help identify patterns of pain, pain triggers, what increases or decreases your pain, and to help us have reliable information after the fact. Rate your pain on a scale of 0 to 10, with 0 representing no pain and 10 representing the worst possible pain. Use descriptive words, such as burning, tingling, pulsating, or throbbing. Track the day and time when your pain occurs. This will show overall trends about when your pain better or worse. Note what you are doing when your pain begins. Did you just get out of bed, or had you been sitting for a while? Were you exercising or overusing certain muscles? It’s also helpful to write down how you feel after activities, such as walking the dog or playing with the kids, even if you don’t experience a lot of pain. Look at other elements that might contribute to your pain, such as season or weather. If you suffer from stiff joints, is it worse when it’s raining or cold outside? Include what you ate and drank that day. Foods and beverages may contribute to or worsen pain. Describe your mood. Note your mental state and how you feel when experiencing pain. Are you depressed? Anxious? Fatigued? Your pain might be triggering these emotions. All of this will help us in many ways, such as identifying potential triggers that cause episodes of pain; discovering changes that have occured in your condition; finding side effects caused by your pain or the drugs you’ve been prescribed; finding needed changes in your medication schedule; and improving communication with your doctor. Remember that you shouldn’t feel like you have to make a note every time you feel pain. That could be overwhelming, but consider three entries per day — morning, noon, and night — or write a recap at the end of each day. If you have a major incident, you can always add more entries as needed. Also, keep in mind that your journal should work for you, whether that’s a simple spiral notebook or a fancy leather journal. For some an app on their phone or document on their laptop may work better. As much as your pain diary can help us as your doctors, it can help you even more. Chronic pain often makes patients feel as though they have no control over their situation, but this is something you can control. You can keep records about what is going on with your body, and we can use that information together to help you regain at least some control over your life, your health, and your pain management. Southside Pain Specialists is your one-stop for pain management. With a multitude of pain relief options tailored to your specific needs, Southside Pain Specialists follow the standards of the American Society of Interventional Pain Physicians, The American Board of Pain Medicine and the International Spinal Injection Society and works hard to provide patients comprehensive, caring pain relief when they need it most. Check out our website or contact us today at 205.332.3155 to learn more.